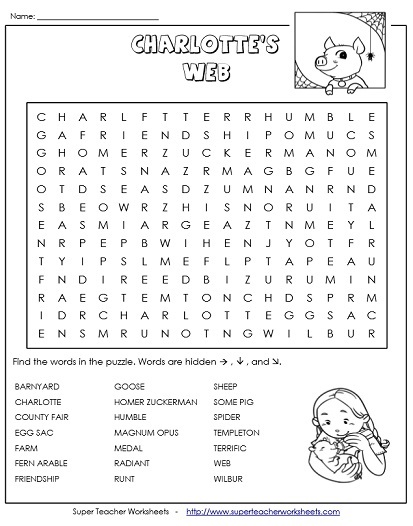 The printables on this page were created to go along with the children's fantasy novel Charlotte's Web, by E. B. White. Worksheets include reading comprehension questions, a word search, literature circle role sheets, writing prompts, and vocabulary activities. This page contains over a dozen short answer and multiple choice questions. The answers can be found in the first four chapters of Charlotte's Web. Vocabulary words are used in a sentence. Below each sentence, define each word. Words include glutton, promptly, gaze, approached, and commotion. The eight vocabulary word cards also have eight corresponding definition cards to use for reviewing the vocabulary words from chapters 1 through 4 of Charlotte's Web. This worksheet has an illustration of a scene from Chapter 1 of the book. Students write a few sentences to describe what's happening in the picture. This worksheet has questions about Wilbur's first encounters with Charlotte and his other barnyard friends. Vocabulary words for these chapters include gnawing, objectionable, wits, scheming, hoisted, gratified, scruples, and hysterics. Chapters 5 through 8 of Charlotte's Web has ten vocabulary words to review with these printable vocabulary cards. Print them on card stock paper or laminate them so they can be used over and over again. Draw a picture of a scene with Charlotte. Write an interesting fact about spiders that you learned in Chapter 5. This printable has comprehension questions about Charlotte's plan to save Wilbur's life, and the first messages she spins in her webs. Vocabulary words for these chapters include oblige, seized, delicate, delectable, attire, idiosyncrasy, and destiny. Have your students practice their vocabulary words from chapters 9 through 12 with these print-and-cut vocabulary cards. This file has questions about Charlotte's second web, the concerns Mrs. Arable has with Fern's behavior, and preparations for the County Fair. Vocabulary words for these chapters include noble, thrashing, vaguely, incessant, mercilessly, monotonous, and snare. Use these printable vocabulary cards to study the vocab. words from chapters 13-16, including: mercilessly, thrashing, monotonous, vaguely, snare, distinguish, and reputation. This file has questions about Wilbur's visit to the fair, the final web, and Charlotte's web sac. Words for this section of the book include fiercely, rejoiced, aloft, vanish, purebred, listless, scramble, and gorged. The vocabulary words for review in chapters 17-19 feature: fiercely, aloft, vanish, rejoiced, gorged, and listless. Use the printable vocabulary cards to help study the definitions of the words. This worksheet has questions about the ceremony at the fair, Wilbur's return home, and Charlotte's children. Words for these chapters include trembled, pompous, rapidly, ails, meekly, desolation, and forlorn. The last few chapters of Charlotte's Web has 10 vocabulary words for review, including: trembled, pompous, phenomenon, meekly, desolation, forlorn, and sentiments. Print and cut out the vocabulary cards to help study the words and definitions. 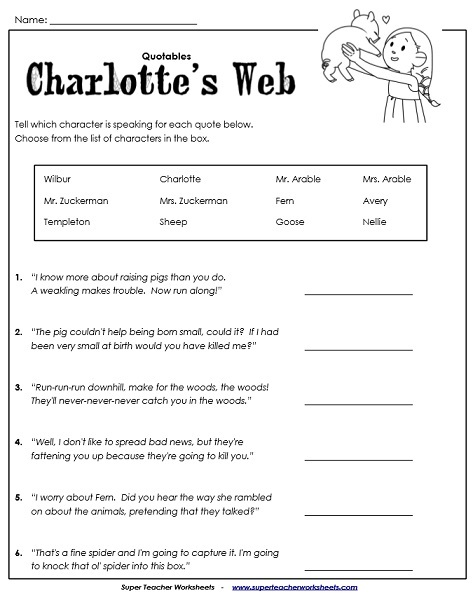 This file contains a series of multiple choice, true/false, and matching questions for the novel, Charlotte's Web. Tell which character from Charlotte's Web is the speaker for each quotation. Find the hidden words in the puzzle. Word list includes: Wilbur, Charlotte, spider, barnyard, magnum opus, Fern, county fair, some pig, radiant, humble, web, and Templeton. Determine which sentences are facts and which ones are opinions. Print a set of four bookmarks with pictures of scenes and characters from Charlotte's Web. The question leader writes open-ended questions to discuss with the reading group. The summarizer writes a short summary of the assigned chapters. The illustrator draws a scene from the assigned chapters. Members of the reading group look at the picture and describe what's going on in the picture. The word wizard finds challenging words from the text and defines them. The real life connector tells how certain parts of the story are similar to events that have happened in real life. This page can be used as a cover sheet to your students' literature circle packets. We have printable questions and activities for many, many chapter books. Some titles include Magic Treehouse, Bunnicula, Stone Fox, Phantom Tollbooth, Mr. Popper's Penguins, and Tales of a Fourth Grade Nothing.